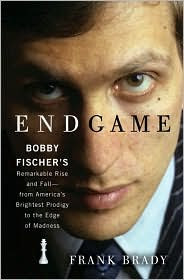 Though he was once considered to be the Mozart of the chess board, by the time he died at the age of 64 in 2008, chess champion Bobby Fischer was widely considered to be a kook who died notorious and m aybe crazy in Iceland. No one is better equipped to tell this story than Frank Brady. The founding editor of Chess Life, Brady has written biographies of two other large and eccentric personalities: Orson Welles and Aristotle Onassis. At least as important, Brady and Fischer knew each other well. They met when they were children and, as adults, their lives and professions often intersected. This actual familiarity with Fischer results in a book that often has a fictional tone, though in fairness, that’s part of Brady’s style: using source material to recreate scenes that the author could not possibly have seen. “At his seat,” Brady writes at one point, “Bobby studied the stage from the audience’s perspective, seeing it as they must have seen it for two months, when they’d watched the combatants in profile.” It mostly isn’t irritating, except for when it is. I know these little visions are meant to be artful, but quite often I find them jolting: an unwelcome reminder that the author couldn’t possibly have seen or felt quite what is being claimed.